Ever notice that most American-Mexican or Italian food is the same five ingredients repurposed in different forms? Well, that's pretty much the way it is with Alpine food -- good hearty winter fare that will warm you up, put some winter fat on your bones, and see you through till thaw. All with the same five ingredients. Of course, that was more important back when you couldn't have a fresh endive-and-imported-grapefruit salad on a whim in the middle of February. You just made do with the ingredients on hand in winter on the mountains: cheese, wine, potatoes, bread, and ham/sausage. Remember the Mont d'Or dinner? So with that in mind, and in honor of my cousin Donna, who requested a posting on fondues, here is not just fondue but also raclette and tartiflette -- three hot, melted-cheese meals you're likely to encounter on a ski trip to the French Alps. Fondue (which translates, literally, as "melted") always means cheese fondue, unless you specify bourgignonne (meat dipped in hot oil) or chocolat (cake and fruit dipped in chocolate -- genius, but not authentically Swiss or French). Sometimes in Paris, to distinguish between them, they will also label cheese fondue savoyarde. Fondue is generally made with Gruyère, a Swiss cheese that used to be, technically, both a French and Swiss Alpine cheese. But as recently as 2001, the AOC declared it to be only Swiss. Though there are options like Comté or Beaufort on the French side of the border, the basic French fondue recipe is generally Gruyère along with some other local, Alpine cheese (often Emmental), white wine, kirsch, garlic, and cornstarch (to help with texture). It is much better if you have an actual fondue pot to keep it warm, otherwise, just do your best to eat it up before it congeals into a hard mass (though I must admit, that mass still tastes good...). Fondues and don'ts: Do be careful when you pull it from the pot; it's melted cheese and real mouth-burner! Just stab one piece of bread at a time, eat straight from the fork (after much blowing), and no double-dipping. More modern, creative fondues might offer you potatoes and other vegetables to dip, too. Usually there are cornichons, or very tart, crunchy mini-pickles on the table for eating but not dipping; many people don't like them, but I love them and start to crave something crunchy and vinegary like that to cut through all the rich cheese. I had always thought that if you lost your bread off your fondue fork in the pot that you were supposed to give somebody a kiss. When I ask the lady at the fondue restaurant in the Swiss Alps if this is correct, however, she says that the tradition is actually whoever loses his bread in the fondue pot has to pay the table's bar tab. A tartiflette is basically a casserole made of potatoes, Reblochon cheese, bacon bits, and onions. 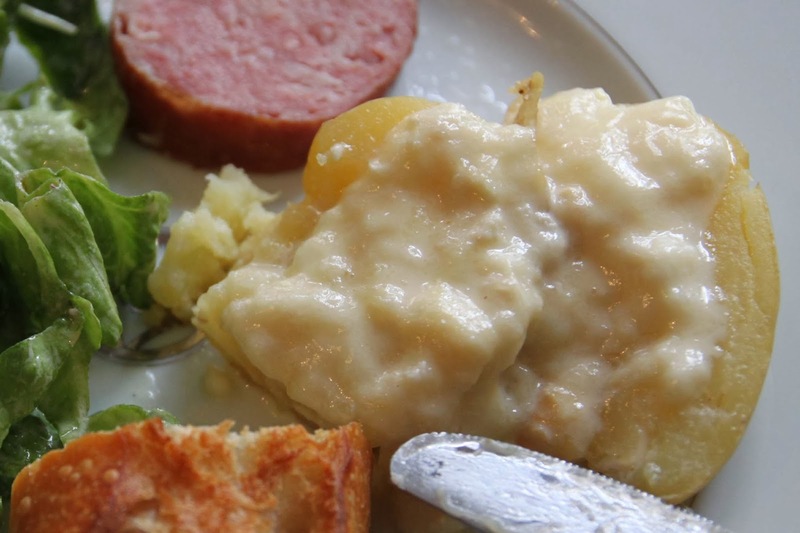 Tartiflette is meant to be hearty, not pretty. You'll see raclette restaurants all around the French Alps, especially in ski towns. Often, they have an enormous hunk of cheese hanging and heating, from which you scrape melted Raclette cheese to eat with your ham, potatoes, and bread. It reminds me of the shawarma you see in Middle Eastern places. There are home gadgets to make raclette (the dish, as opposed to Raclette, the cheese). They rely heavily on Teflon and let you grill meats on top while melting slices of cheese down below. These melted slices slip right off onto your plate/bread/potatoes/meat. This is what Raclette Jurasienne looks like before it's melted. Of course, nobody gives two hoots what it looks like uncooked and, in fact, nobody eats it that way. It's edible; it won't make you sick or anything. In fact it's rather sweet and nutty, as it's related to Gruyère or Comté or Beaufort. But it just isn't that kind of cheese: It's a cheese for heating then eating. That's its raison d'être. Raclette, which is cut off a big wheel, is made from raw cow's milk aged at least 8 weeks. Sure, I admit it: I would have used Gruyère for today's cheese if I could have. Darn that 2001 AOC ruling that makes it no longer French! But that's OK, because I have not just one but several Raclettes to choose from: Jurasienne being a good, classic version whose name, Jura, comes right from the French region of the Alps. There are also smoked versions and other alternatives. Who knows what postings they might accompany?